It’s no secret that I’m a Nikon fan…You kinda have to be when you’re years deep in collecting thousands of dollars of lenses. That’s why when Nikon recently announced the release of the D3s I thought to myself, this is it: the last camera I will have to buy for a long, long time. All of my fishing adventures, blog posts, assignments can finally be captured on one machine (photo and video) …. 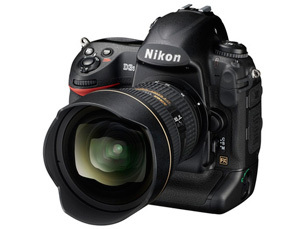 The D3s boasts a full frame sensor, insanely high ISO settings (102,400 to be precise), nine-frames-per-second continuous shooting, and — much to my chagrin — 720 HD video. You see, for $5200 dollars I really think this thing should have come equipped with 1080 HD. Its nearest competitor, the Canon 5D MkII, is a full frame sensor camera that shoots 1080 HD and it’s almost half the cost. Matt Buchanan gives us the ins and outs of the D3s over at Gizmodo and raves about the fully redesigned sensor that seems like it could change the way we think about shooting in low light conditions. So wipe that drool off of your keyboard let me know how to win the lottery so I can plunk down hard cash for this bad boy.